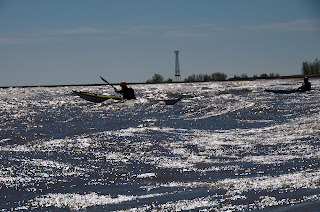 Scott, surfing a wave at the Geneva Kayak Center's Yorkville site. All good conspiracies are grounded in a solid motivation. Last night's conspiracy to host a 50th birthday party for Scott Fairty was no exception. When Scott was hired as Geneva Kayak Center's general manager a few years back, Chicago paddling instructors knew our students wouldn't be the only beneficiaries. We, too, had a new mentor--one who soon also became a paddling partner and friend. 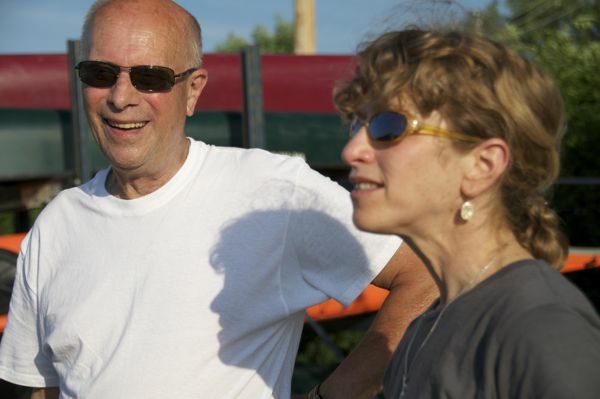 Part one of the conspiracy was the party, attended by various local paddlers as well as Scott's three kids and his father, Jack. Caitlin, Gordon and Tara Fairty. Jack Fairty, who drove in for the occasion. ...then finds, inside a small box, a model of the boat that will arrive in a week or so. No 50th birthday party would be complete without a little ribbing from the kids about Scott's age. "Over the hill!" 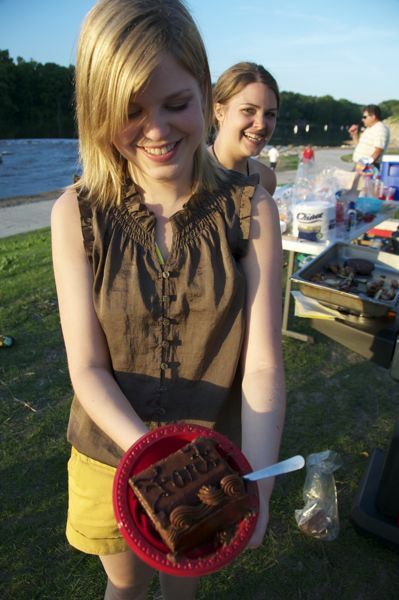 the cake declared. 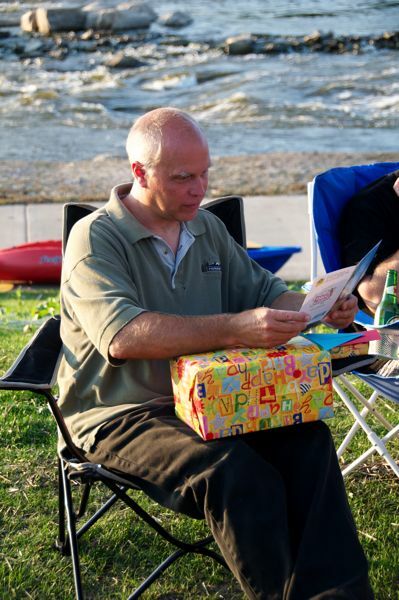 "Happy birthday, you old fart." Caitlin serves Scott a choice slice of cake. There may be nothing magical about celebrating the actual day on which a person was born, but it's a great opportunity to celebrate the person. 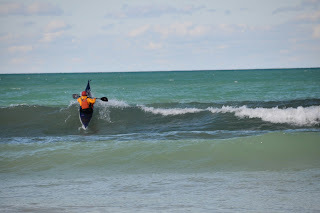 Scott has brought a lot to the Chicago-area paddling community. We're looking forward to many more years on the water with him. 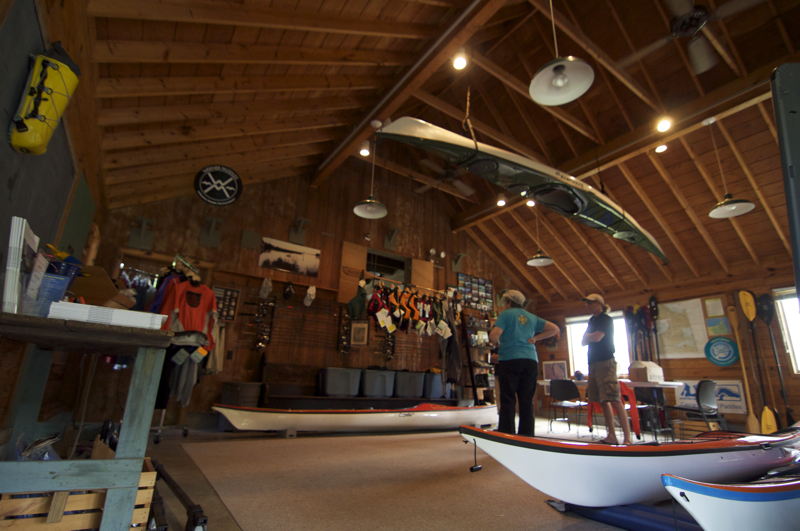 The new Adventure Crafters space at CBEC (Chesapeake Bay Environmental Center). 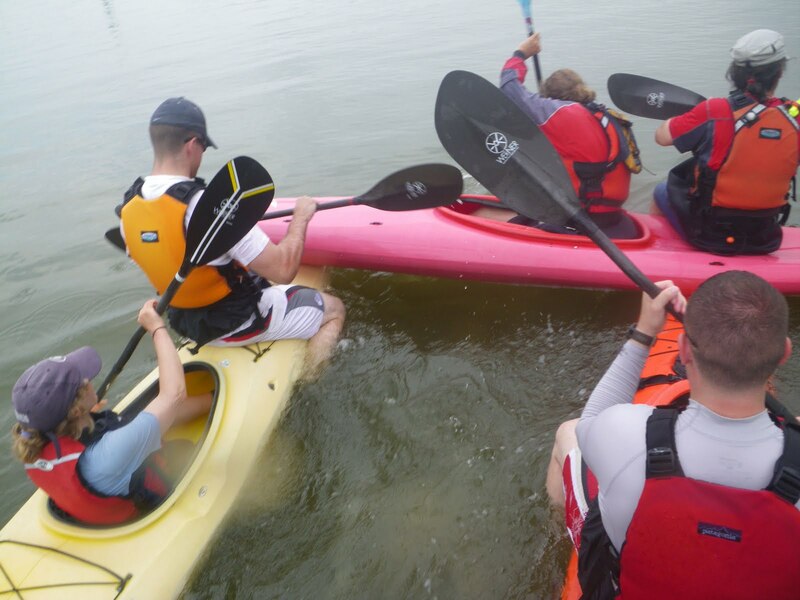 Every summer, we spend a weekend teaching at Adventure Crafters in Maryland, a paddle center with a heavy emphasis on instruction and a loyal following of long-term students as well as a continuous influx of newer paddlers. 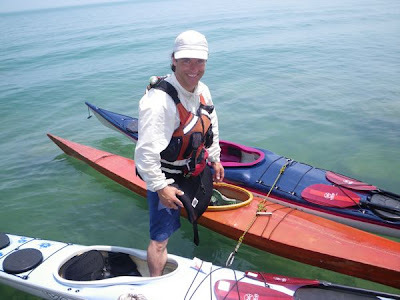 For us, it's an opportunity to paddle and teach on salt water, try out some of our coaching ideas in a new environment, and reconnect with owner Robert Schrack, his family and the paddling community Adventure Crafters has nurtured. 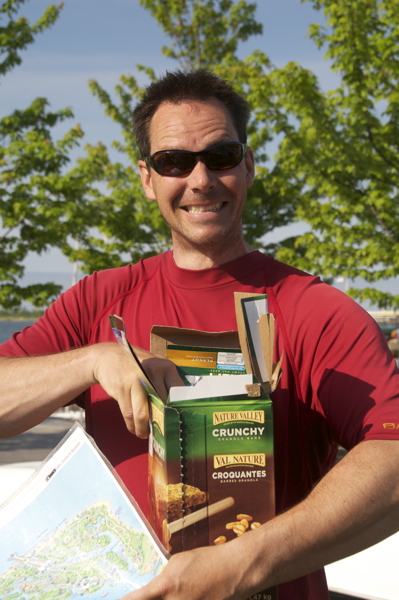 Robert Schrack in his office at Adventure Crafters. This year, we arrived early enough to meet Robert at Cape Henlopen State Park in Lewes, Delaware for a day of paddling on the coast, where we were treated to a sweet tidal race. 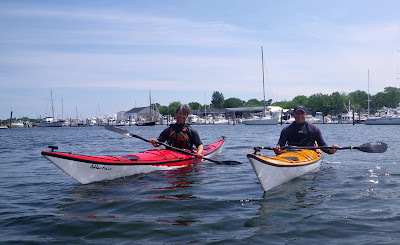 Then we returned for two days of classes in Queenstown, Maryland. 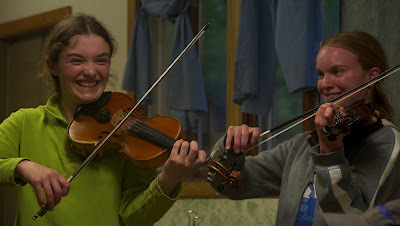 Two students in the "Yes, You Can!" 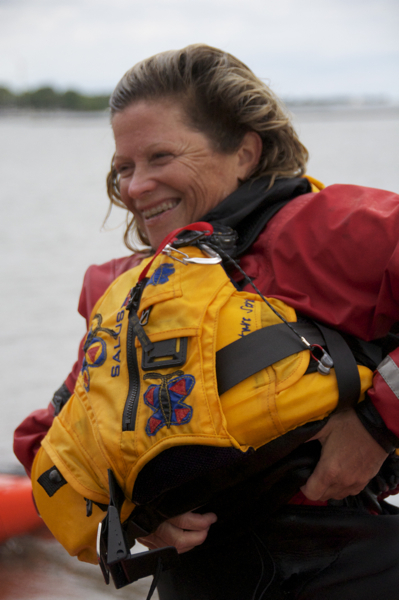 women's class, celebrating a successful assisted rescue. Somehow, no matter how we bill a particular class, we always end up returning to fundamentals. 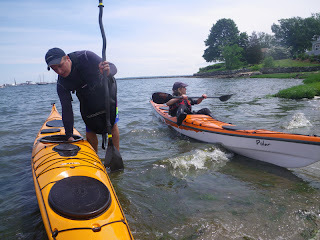 Students at every level seem to benefit from a review of the essentials of successful paddling: posture, connectivity, torso rotation, edge control, paddle grip and angle, and basic strokes. Small instructor-to-student ratios enable us to address these simultaneously for students with various levels of proficiency. If all that sounds like work, it shouldn't. We include lots of games and activities--everything from clambering on the deck for balance, to cockpit basketball for maneuvering--to develop skills on a less conscious level. This concept is neither new nor unique to us. We owe a debt to the BCU (British Canoe Union) and a myriad coaches with whom we've worked who've emphasized the importance of games and activities in learning. We end every visit with a rousing rodeo event, which is just plain fun. 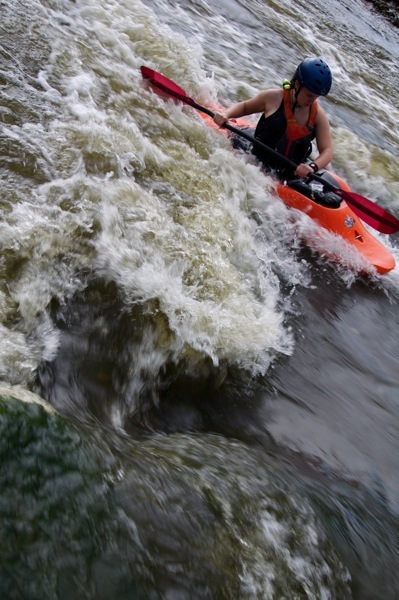 Racing a raft of kayaks, a new rodeo event we learned from Kelly Blades. Time flies when you're having fun. We spent our last day paddling again with Robert, reflecting on our classes and spotting eagles and herons along the banks of the Chester River. Long-term paddling relationships are special, whether they're with students, fellow coaches, friends or family members. Those of us who have a mix of all four are fortunate. 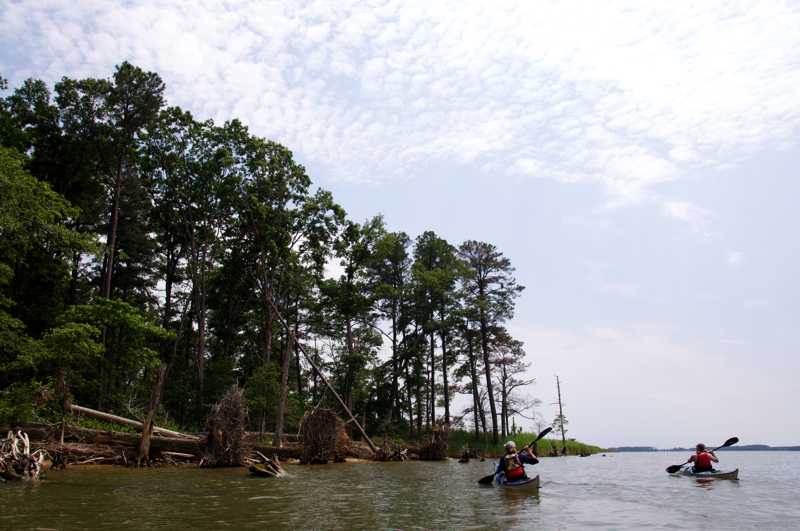 Final day of paddling in Maryland. We'll return in 2012. 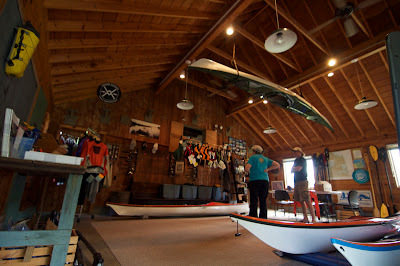 The Kayak Centre of Rhode Island in Wickford, RI. En route from Toronto to Delaware, we paid a visit to Matt Bosgraaf, who wears two hats: inventory manager for the Kayak Centre of Rhode Island, and east coast sales manager for GRO (Great River Outfitters, the east coast importer of Valley and North Shore boats)--two completely separate enterprises. 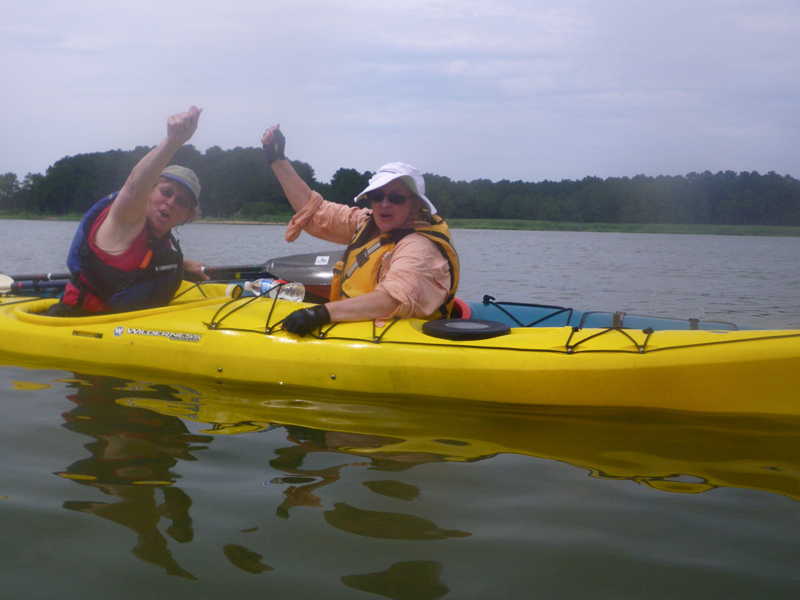 Fortunately, we were able to pry him away from both for a couple of hours on the water. 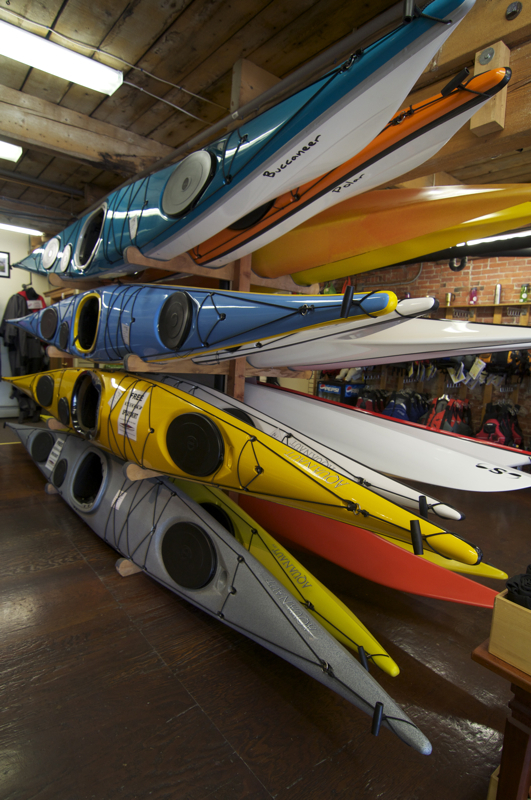 The Kayak Centre has a large showroom and offers classes, tours, rentals and repairs. 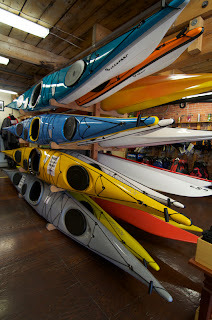 The Warsick location carries between 120 and 140 boat models, including sea kayaks, recreational kayaks, sit-on-tops, fishing kayaks, racing boats and more. We took advantage of this extensive inventory to try out a few boats we'd never paddled: the Valley Etain 17.5, the North Shore Polar, and the North Shore Atlantic LV. 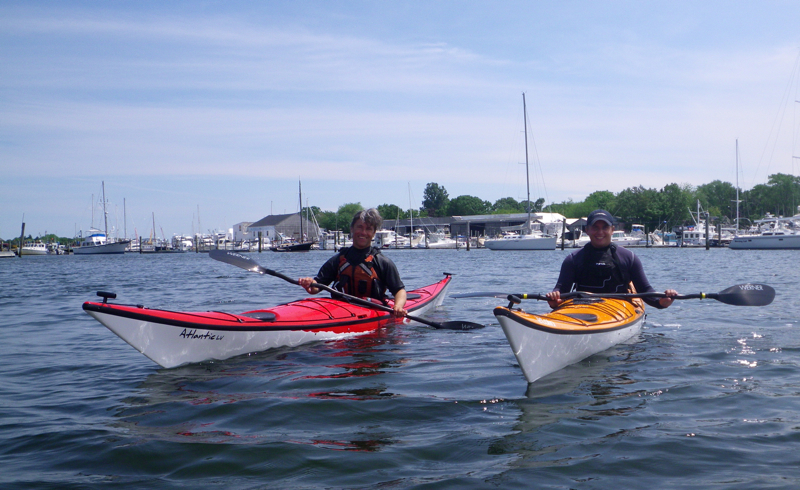 Alec and Matt in the harbor near the Kayak Centre. 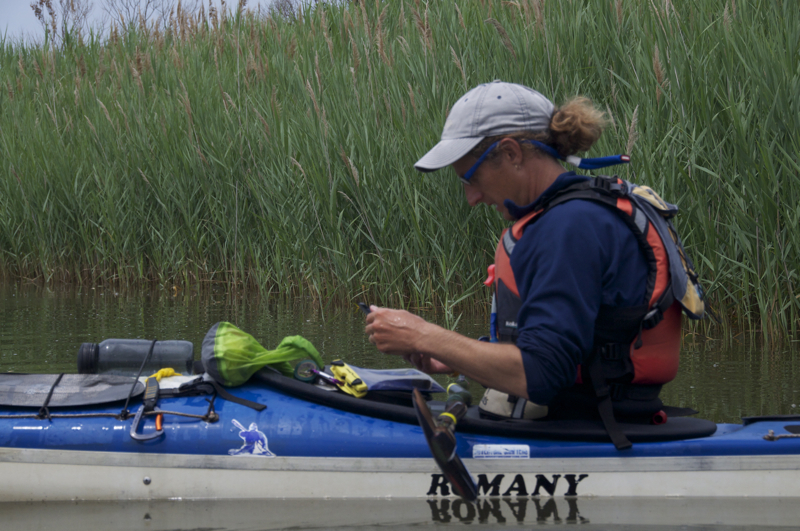 Switching boats midway through our paddle. The immediately environment is remarkably diverse. 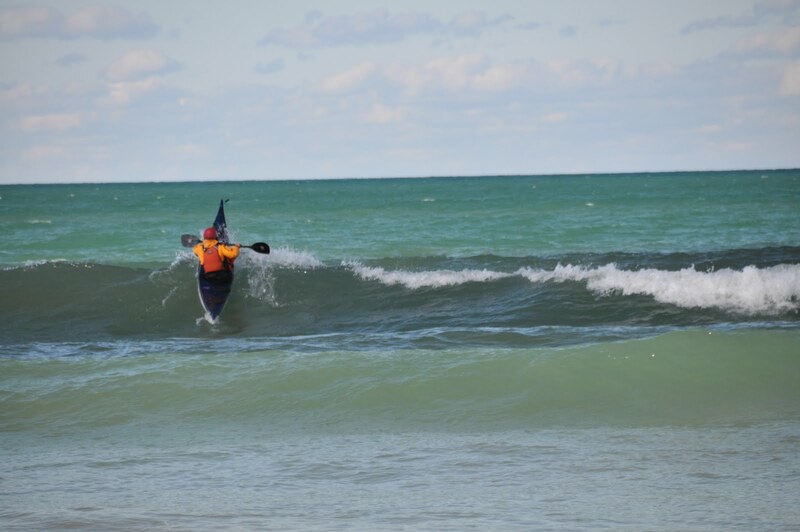 Within 10 miles of the shop, there are all sorts of conditions: calm water, rough water, current, surf, rocks, and even a tidal rip. We didn't have enough time to explore beyond the bay on this trip, but we'll be back. After all, we have another 117 boats to try out. 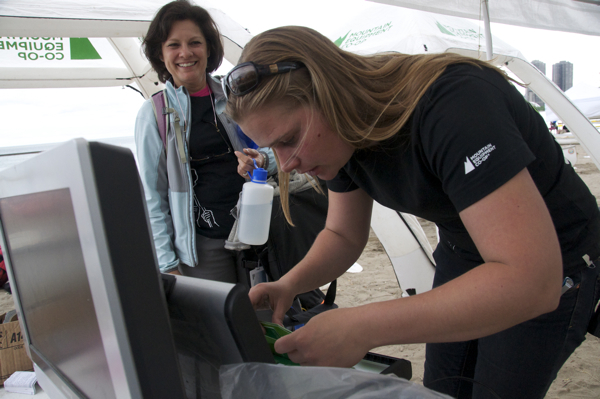 One beach, two days, 600+ new paddlers. 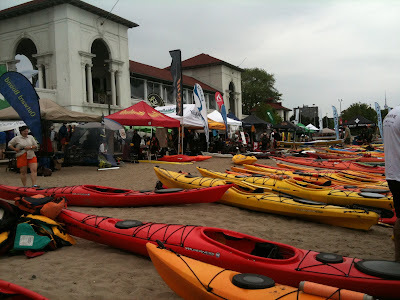 We just returned from MEC Paddlefest Toronto, an "urban celebration of all things paddlesport related" run by Mountain Equipment Co-op, the Canadian equivalent of REI (more or less). "Celebration" hardly begins to describe this astonishing event. Over the course of two days, Paddlefest offers land and water clinics on sea kayaking, whitewater kayaking, canoeing and stand-up paddling, complete with all necessary equipment, for people who register in advance or sign up on-site. Sponsors and clubs staff informational booths, vendors provide demo boats and gear, kayak polo players shoot baskets, and dragon boats zip back and forth. 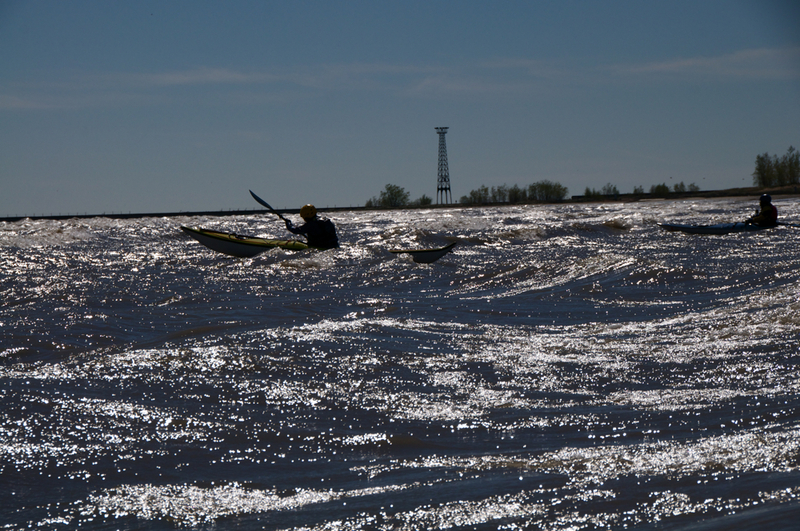 For two days, Sunnyside Beach is awash in a wide diversity of boats and people. The master organizer behind Paddlefest Toronto is Liz Burnside, who didn't seem nearly as frazzled as she ought to have been. Chalk it up to some magical alchemy of experience (she's run this event five times before), talent and temperament; the event ran remarkably smoothly. Liz Burnside, keeping the event on track. Before the festival began, about 20 instructors took advantage of a "mini instructor symposium" organized by Erik Ogaard, a Paddle Canada Instructor Trainer and head of paddling instruction for the Harbourfront Canoe and Kayak Centre. This provided an opportunity for us to meet some of the energetic Canadian coaches and for all of us to get an instructor update. David Johnston, fellow coach and blogger, and Keith Wikle's Canadian doppelganger. Dympna Hayes, the infectiously energetic co-owner of learntokayak.ca. 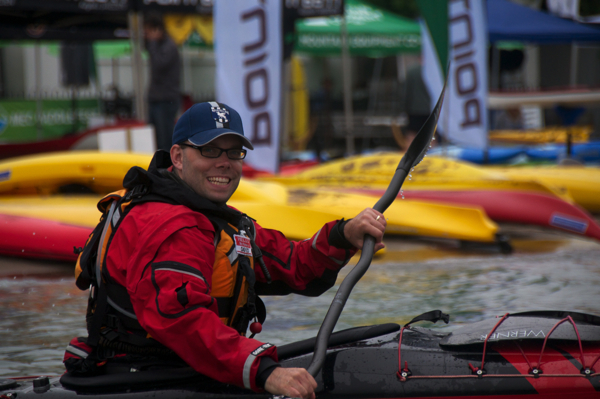 Michael Pardy, co-founder of SKILS and Senior Instructor Trainer for Paddle Canada (one of his many outdoors and paddling certifications), shared some of his "detection/correction" strategies for helping instructors improve students' strokes. 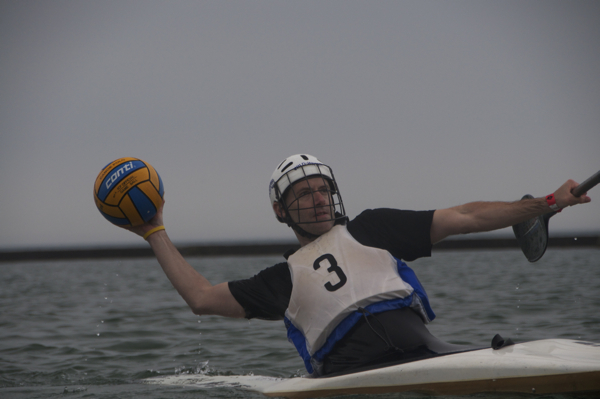 Kelly Blades, who defies description, showed how games can help to develop balance and boat control. Erik, ensuring that everyone fuels up. 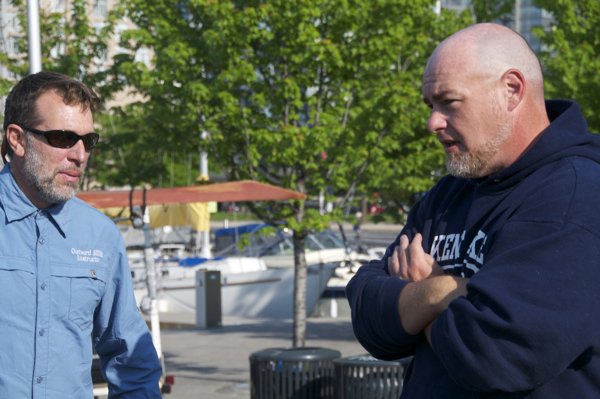 Michael and Kelly, strategizing about our instructor update. The fest itself was eye-opening for us. Classes were 90 minutes long, and most students had signed up in advance, paying just $10 for each on-water course and $5 for each land-based course. In defiance of the idea that people who pay less care less, these students could not have been more committed. They showed up in whatever clothing they had -- often nothing more than quick-dry shorts and tops -- eager to get on the water, which was still in the mid 50s. 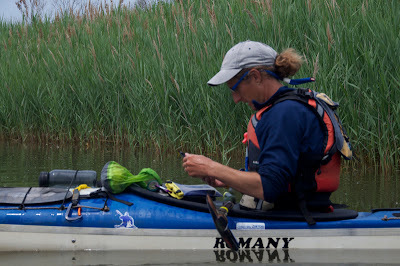 We quickly found them boats, PFDs, skirts and paddles and took off, wondering how long they would last once they got wet. But they were tenacious; they wanted to get everything they possibly could out of each of us. Even our rescue and rolling clinics, during which participants were immersed most of the time, didn't dissuade these avid students. 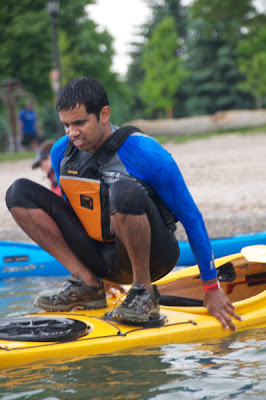 Many participants lacked appropriate paddling gear, but that didn't stop them. They spent time working on strokes, rescues, rolling and more. 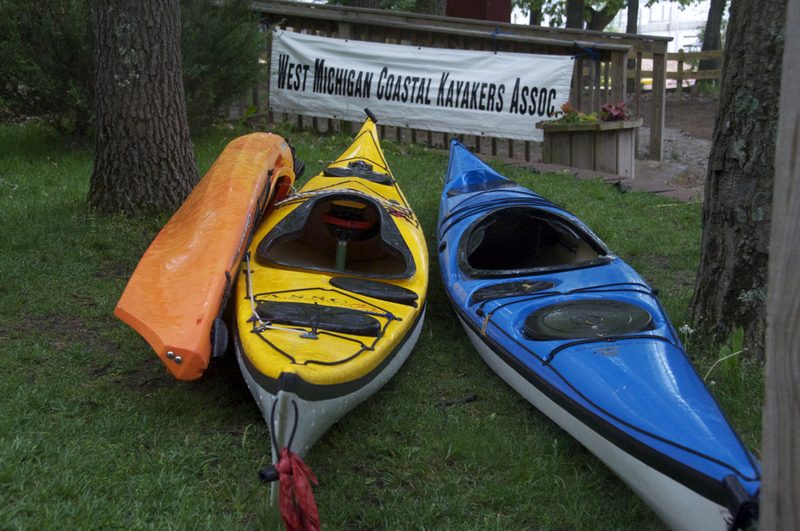 The concept behind Paddlefest is to introduce people to paddlesports. It's a taster, and its success is best measured in the enthusiasm of the participants and their eagerness to learn more in the future. From every thing we saw and heard, this year's fest accomplished those aims. Hundreds of people discovered the pleasure of getting out on the water in a human-powered craft. That's a pretty hefty accomplishment for one weekend. 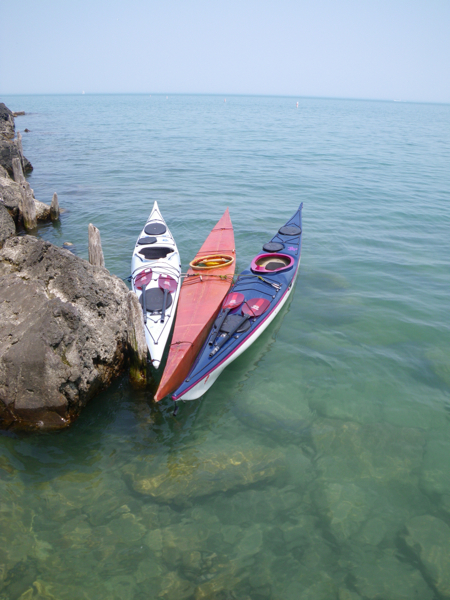 We recently completed and delivered a presentation called "Paddling in Chicago," a historical journey down Chicago's manmade coastline that explained why and how today's familiar features were created. In the process, we learned things we didn't previously know, and rekindled our own interest in our local shoreline. Today we returned to one of the places that fascinate us most: the far South Side, where the shoreline is built of cast-off relics from the demise of the US Steel Southworks plant. At its peak, the plant employed 20,000 people and produced beams that were used in the Sears Tower and other skyscrapers. When it closed in 1992, it left behind a pile of twisted steel and concrete boulders, weeds and imporverished neighborhoods. And yet, this section of the shoreline is lovely. The massive slabs of casting material look like volacanic boulders; broken-up hunks of concrete buildings and staircases seem like strangely sculpted rocks. 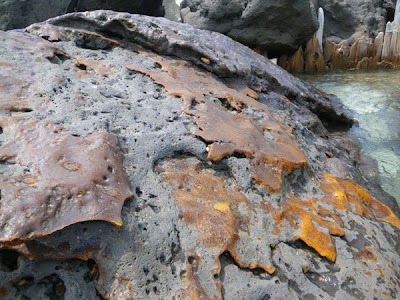 Elsewhere this might be a lichen-covered rock. Here it is a steel-impregnated casting slab. A piece of rebar stands in for a sturdy root or belay rope. That "standing in your boat" game turns out to have a practical application. 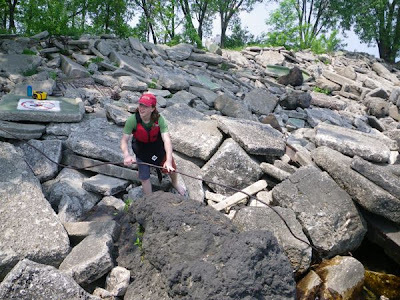 Chicago's shoreline is anything but natural, and sometimes we mourn the lack of wild spaces around here. But after industry leaves, nature starts to take over, and there is a pleasing, post-urban quality to this stretch of shoreline. The more we learn about it, the more we appreciate it. 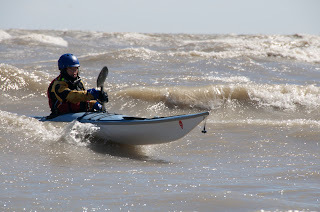 Spring finally arrived, and with it a range of pleasing water levels at the Yorkville whitewater course, the annual West Michigan Coastal Kayakers Association symposium, and waves on Lake Michigan. 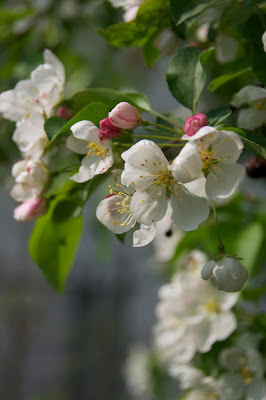 Flower blossoms herald the season. Blame it on the season; we were too busy to post. But not too busy to paddle. We experienced the Yorkville whitewater course at fun levels between 2,300 cfs and 3,600 cfs, as well as the not-fun level of 6,800 cfs, when nearly all the features were washed out and we chose not to attempt a first descent of the sidewalk. 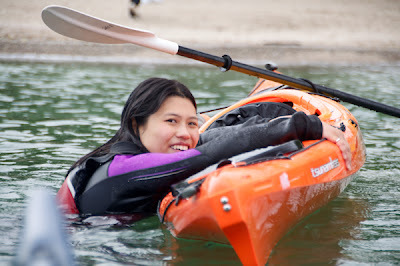 Hannah, back from college, reunited with her kayak. 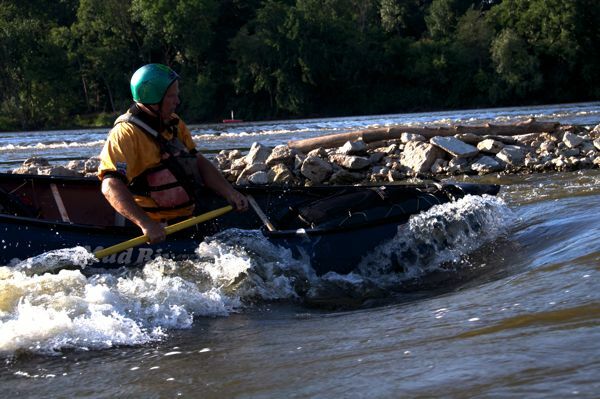 We also had the pleasure of attending the grand opening of the whitewater course, now named the Marge Cline Whitewater Course in honor of the Chicago Whitewater Association's "River Mom," who died in 2007. We even got to take the Mayor of Yorkville and a few aldermen down the course in a raft. The cold start to the spring was caused, in part, by weather patterns that were still bringing cold air to Chicago from the north and northeast. Here that means waves, and we had plenty of autumn-like surfing days early in the season. 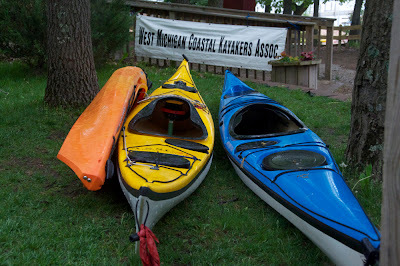 By Memorial Day weekend, we were ready for warmer weather, which slowly arrived during the annual West Michigan Coastal Kayakers Association symposium. 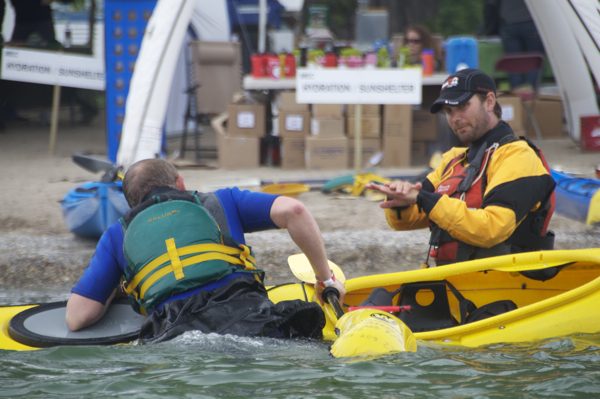 The event was abbreviated this year by an afternoon thunderstorm, which kept everyone off the water all afternoon on Sunday. But we had the good fortune to have two stellar fiddlers among us -- sisters Carrie and Emma from the Upper Peninsula -- who kept our spirits up when the weather threatened to douse them. Next up: the Toronto Paddlesport Festival. Stay tuned!